Chandler Concrete supplies ready-mixed concrete, masonry and hardscape concrete products. In our Salisbury, NC location, we have incorporated a building supply center called, Chandler Building Supply Company. This location carries various building supplies for the builder or individual. You can also find a large hardscape display from our Grotto Hardscape line. Since 1946 Chandler has built a strong reputation for superior quality and outstanding customer service focusing on exceeding the customers’ expectation the first time and every time. Chandler Concrete Company’s network of ready-mixed concrete plants serves central and western North Carolina and Virginia and eastern Tenn and southern West Virginia. 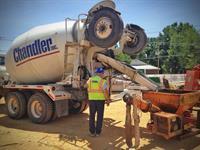 Chandler allows for timely dispatch and delivery of concrete tailored to your strict specifications. Chandler Concrete's masonry units are made for commercial building, institutions and residential projects. The masonry units are produced in many sizes and shapes with various face finishes and glazes offering a wide variety of colors and texture to add interest to any finished building. Chandler's hardscape division, Grotto Hardscapes, offers a complete line of quality, cost-effective concrete hardscape materials from segmental retaining wall systems to concrete pavers. Mr. William Thomas Fisher, Jr.